Collagen Pro-Active “The Top Choice” Athanasios Badekas – Orthopedic Surgeon, President of the Scientific Commission of the European Company for Ankle and Foot. Collagen Properties Collagen is the main constructive protein found in connective tissue within the human body but also in other living organisms. 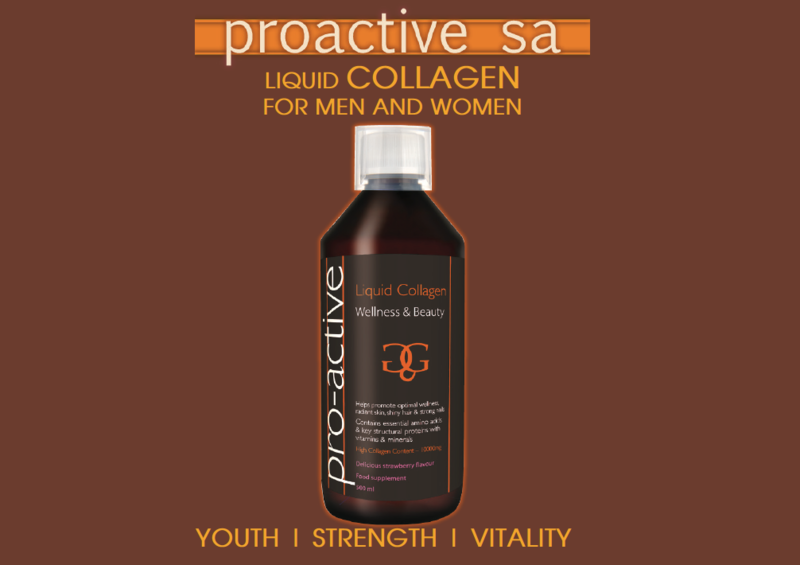 Collagen participates in a chain of natural processes occurring in the human body. • It builds and reconstructs the intercellular matrix of bones. In particular, it activates the chondrocytes which control the pace at which cartilage is regenerated. • It improves bone strength, by increasing bone density hence; it can prove useful in the therapy of osteoporosis and osteoarthritis. • It strengthens the capillary walls and improves the cardiovascular functions and overall blood circulation. • A potable form of collagen. • It has become widely known in recent years and quite popular among consumers thanks to the fact that it is easily consumed, but also because it is less harmful to the digestive system. It is considered to be extremely absorbable by the human body (up to 90%) and that is why it is thought of as more effective than the pill while it is suitable for a range of different conditions such as cartilage injuries, arthritis and osteoarthritis. • Hydrolyzed collagen, thanks to its low molecular weight is easily digested and therefore more absorbable by the human body and more specifically by the wall of the gastrointestinal tract into the bloodstream. • It is present in a high concentration within the joint cartilage but also activates collagen production by the chondrocytes resulting in the increasing number of fibroblasts, hence, making it ideal for the treatment of joint cartilage injuries and conditions. Individuals who experience joint pains (people of old age, individuals who sit for long hours, those who lift weights on a daily basis and those who put a strain on their joints such as athletes) can benefit from collagen. affect the patient’s quality of life due to the immobility they cause while they are a great burden on the national economy due to loss of earnings. Collagen Pro-Active in its pure form is a reliable alternative solution to combat degenerative and post-traumatic arthritis of the limbs without any side effects, with cartilage-protective and pain-relieving properties in the initial stages of arthritis and at the same time, with the ability to increase the sufferer’s ability to move. Now available at IHA for R950 a bottle in two flavours: Strawberry and Lemon.